• Soak noodles at least 2-3 hour or preferably overnight. • Meat or fish are cooked separately and set aside. • Vegetables are cooked separately and set aside. • Rice noodle is cooked separately with sauce and the meats and vegetables are reintroduced to the noodles. See pictures of some of the ingredients at the bottom of this page. You will find these products in the Asian part of the market. Or you can visit the Asian market, Super 88 in Brighton. Soak rice noodles at least 3 hours or overnight. Drained and set aside. Note: Drained noodles can be kept in refrigerator in a container or plastic bag for several days. On high heat, using a large skillet, pour enough oil to cover the bottom of the pan. Add chopped garlic and brown. Add and brown meat (cook meat to desire doneness.) and/or combination seafood or tofu in a single layer. Set meat and/or seafood or tofu aside onto a platter. In the same skillet on high heat, pour more oil to cover bottom of skillet and add more chopped garlic and brown. Since onion takes the longest to cook, sautéed sliced onion first until wilted. Add remaining vegetables. Sautéed until vegetables are cooked to your likeness. We like our vegetables crisp. Set aside vegetables. In the same skillet on medium high heat, pour more oil to cover bottom. 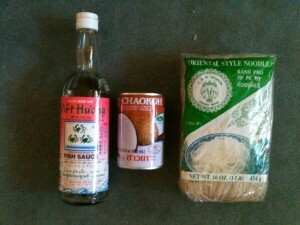 Add rice noodles, chicken stock or water, coconut milk, fish sauce. Turn down heat to medium. Keep stirring the noodles around so that it does not stick to the bottom. Cover skillet with lid. Stir every two minutes and check for doneness. The noodles will absorb the liquids. If all the liquids are absorbed before the noodles are cooked, add a little more chicken stock or water. Keep stirring until noodles are cooked to your desire. Add cooked vegetables, meat/seafood or tofu and stir until incorporated. Check for seasoning, add more fish sauce if needed. Top with chopped cilantro leaves.